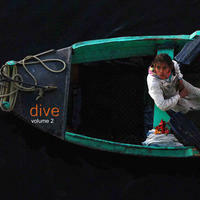 Sandeep Bhandari : Dive Volume 2. While continuing the exploration of music for land and water, this volume of instrumental downtempo/ambient electro-acoustic music expands the instrumental palette used in the first volume and strives to dig darker yet shine brighter. This album is a continuation of the previous volume and its focus on beat-driven acoustic songs but with a stronger focus on heartwarming pop melodies. Volume 2 sweeps its way across 10 songs using a mix of live and programmed instrumentation mixed together with delicate precision. Finger-picked guitars ring out, bells twinkle and chime, Rhodes piano echo softly while moog synths resonate and wash over this aural landscape.